Survata is a company which allows you to offer your visitors anonymous surveys so that they can unlock exclusive content or experiences. If you own a business, you may also hand-craft surveys with unlimited questions and present them to your target audience. Providing publishers with an excellent content-locking service and helping businesses get feedback from their target audience before making any decision—quickly. Survata provides services both for businesses wishing to conduct a survey, and for publishers wishing to monetize their web properties via survey page/content locking. Publishers wishing to explore the options presented by Survata’s network will find that they have several advantages of doing so—and, depending on the situation, some disadvantages (which will be discussed in the editor’s review). Publishers have the opportunity to “lock” content with a survey—referred to as a “surveywall.” This means that if you have content on your web property which you would like to be only accessible by visitors who complete a survey (for which you get paid), you can prevent them from accessing it until they have done so. Popular content locking options include ebooks, audio content, free trials, or an “ad free” experience on your web property. 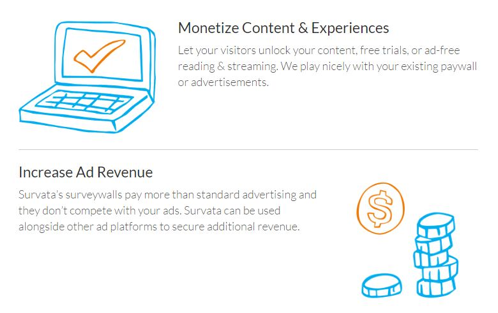 Survata can help you further monetize your website without having to remove your currently existing advertisements, as Survata is compatible with most or all ad platforms—double check your other advertising network’s current requirements and make sure that Survata has kept up to date with requirements, as these things can change at any time. What We like: Publishers have access to customizable survey locking for their web properties. What We Don’t Like: Publishers may have better options (see editor’s review below). Implementation Technology: Survey locked content. Control Panel: Survata’s control panel is simple and easy to use. Reporting: Reporting is clear and concise. 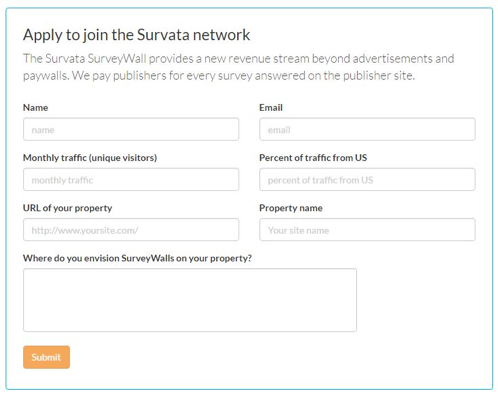 Survata surveys create a “surveywall” on your web property—it’s important to understand that this will be only for content which you wish to have locked (meaning that the user must complete a survey to access it). The rest of your site will be perfectly accessible as normal. This total control means that if you’ve created, for example, some kind of extra-valuable content, you can “lock” it behind a survey. If your visitors complete these surveys, you’ll be paid, and they’ll have access to the extra special content. Good options for content include ebooks, podcasts, special reports, free trials, membership upgrades—you name it. Survata’s terms allow you to lock most types of content. You’ll also have the option to lock multiple content items on your site, meaning that this isn’t a one-off — if you want your users to access, say, a second ebook or podcast, they’ll have to complete another survey. A word on anonymous surveys: these are the type provided by Survata, and are generally much easier to get visitors to complete than surveys which ask for full personal details. If you’ve been working with a surveywall provider and have had poor results, it’s likely that they’re asking your visitors to provide them with too much information. Survata surveys are anonymous and your visitors are much, much more likely to actually complete them because of this. A note on content locking: generally speaking, some webmasters might find that using a customizable content locking option may yield better monetization results. This isn’t something which reflects poorly on Survata, it’s simply a matter of fact in some cases. Customizable content locking implementations give you a lot more freedom to play around with different offers which might end up making you more money. Having said that, implementing Survata’s surveywalls are a great way to start testing content locking and how your audience will react. They’re easy to set up and don’t require any personal information from your users. If you don’t like the results or if you find that your visitors are turned off by this change, you can simply remove Survata from your web property or try a different method/offer to lock your content. In some cases you may find that Survata converts better than your custom content locking options, so as with most things monetization, it’s a great idea to continually test and weigh results to yield the most income from your web properties. For publishers, it’s a dead-simple way to lock content—however, depending on the value of your content, you may be able to make more money by utilizing custom locking software. However, if you’re just looking to test content locking and how your audience might respond, or you want something which you can implement quickly, Survata is a great option.